It always seems so unfair that people tend to get sick in the springtime. Just as the weeks of perfect temperatures and sunshine get underway and you want to be outside all the time just soaking in the gorgeous weather along come allergies, and sinus infections, colds and flu, etc. This year I was lucky enough to get sick twice in rapid succession so for the last week or so I have had a hard time focusing on anything more complicated than what time of day to take my next dose of decongestant and how many packages of tissues I need for any given event. And of course remembering to never forget to take hand sanitizer everywhere so as to avoid infecting others. I’m finally starting to feel human again which means now I’m realizing how quickly my task list grows when I’m not functioning at normal capacity. Basically, if you can’t focus you can’t get much done. I did an informal poll of my coworkers to find out what helps them focus and learned that what works for one person might not be helpful for another. For example, headphones were mentioned by several people but there was disagreement as to whether they foster concentration or create distraction. One of my colleagues mentioned that she gets distracted by new music but familiar tunes become a sort of background noise that help her focus on tasks. When she said that, I realized that I have the opposite experience. When I listen to music I know well, I start humming along and even dancing around (obviously it’s an understated nerdy seated dance only performed when nobody is looking). For me it’s often better to listen to music without lyrics. Another colleague mentioned the value of white noise, which I have not yet tried but is an excellent idea. It’s the workplace equivalent of sleeping with a fan running to drown out noisy neighbors. I downloaded an app called White Noise Lite. It not only offers lots of sound choices, from box fan to rain forest, but also says users can “record and loop additional new sounds with total ease”. That is a really cool idea if there is something specific that you enjoy hearing. I’m thinking that the fountain and wind chimes on my patio would be perfect for relaxation; every time I hear these sounds I will picture myself lounging in the hammock (note: this may or may not be ideal for workplace productivity). Another tip offered by several of my coworkers was to remove distractions. Put away your cell phone, turn off email notifications, log out of social media, etc.. You can employ a plug in like LeechBlock (for FireFox) or StayFocusd (for Chrome) that will limit the amount of time you can spend on distracting websites if that is an issue for you. Know the best time to perform certain tasks and organize your workday accordingly. Is the office noisy between 11am and 1pm? Schedule menial tasks that only require short attention span or get caught up on your emails during that time. If certain distractions are too much, you might even change the location of your desk. I recently moved to a new cubicle for reasons unrelated to concentration and was surprised to learn how much easier it was to focus in my new location – even though my former desk had been fine, this one was an improvement. Another suggestion involved switching from a regular desk chair to a stability ball. Giving your body the ability to be positioned in a comfortable way makes it easier to keep your mind on task. A similar strategy is used successfully with students who have ADHD. I, too, find my stability ball conducive to getting things done efficiently. Something about staying physically engaged instead of slouching into my chair keeps my mind active as well. A stability ball might not be the best solution for everyone; finding a more comfortable chair that improves your posture could be just as beneficial. The key is finding what works for you, not settling for whatever dusty old seat was assigned when you got hired. The most valuable and interesting advice came from one of our student assistants, Jessica. I was especially interested to hear from our students because their desks are in the most highly travelled area of our department, right out in the open without even cubicle walls to keep distractions at bay. Surprisingly, her first tip was not to avoid distractions but to “get comfortable with the distractions”. In other words, don’t get frustrated with them or try to pretend like they don’t exist – accept them and get over it. This fits in generally with the concept of mindfulness that has been proven in countless studies to boost productivity. Be present; focus on the here-and-now; be totally aware of where you are, what you are doing and what is going on around you. Mindfulness is a key aspect of many meditation practices but can also be as simple as taking a few seconds during a stressful time to focus on your breathing, notice your posture and get centered in your surroundings. So, to summarize: the best tip to stay focused is to not get sick, ever. If that proves impossible, try some of these tips to get back and stay on track — especially practicing mindfulness. Schilling, D. L., K. Washington, F. F. Billingsley, and J. Deitz. “Classroom Seating for Children With Attention Deficit Hyperactivity Disorder: Therapy Balls Versus Chairs.” American Journal of Occupational Therapy 57.5 (2003): 534-41. Web. Shao, Ruodan, and Daniel P. Skarlicki. “The Role of Mindfulness in Predicting Individual Performance.” Canadian Journal of Behavioural Science 41.4 (2009): 195-201. ProQuest. Web. 10 Apr. 2015. Anyway, looking at my ever-evolving task list made me realize how varied my days really are. I am preparing for a presentation at the Electronic Resources & Libraries Conference at the end of this month. For the introduction to my presentation I am writing a description of a “day in the life” of an Electronic Resources Librarian in an academic library. I am struggling a bit to do so, however, simply because no two days are alike. That is one of the really great things about my job as an academic librarian, actually! There is very little down time and things are different every day, always interesting. Seriously, if you get bored doing this job then you are not doing it right! • Pulled a list of ebooks that were recently added to one of our online reference collections; created a spreadsheet to organize the titles by subject areas and subject librarians; emailed each subject librarian to let them know about our new acquisitions. • Spent 30 minutes trying to answer a seemingly-simple question from a professor about ebooks that, as ebook questions usually do, got complicated and involved emails between myself and, eventually, five other librarians before the question “How much of an ebook can be put on course reserve and in what format?” was finally answered. • Spent another hour or so trying to answer more seemingly-simple questions, these from a student who was having trouble understanding how our ebooks work and how to interact with the various ebook platforms. The question “How do you check out an ebook from the UNT Library?” seems so simple…but, trust, it is not simple to answer. • Learned that one of my collaborators on a presentation for the upcoming ER&L Conference is not attending the conference or interested in participating in the presentation at all. Began working on a new outline to restructure the presentation to include content from two instead of three presenters. (Sigh). • Fielded some random promotional emails from vendors, decided which products being promoted might be of benefit to various people or departments in the library, emailed various people in various departments to determine if there was interest. Saved all feedback in appropriate files for future product evaluations. • Pulled usage statistics for a Graduate Library Assistant to add to our ever-growing database of statistics. • Updated the Promotions Workflow. Part of my job is promoting our electronic resources – because what is the point of buying them if nobody knows about them. Another important part of my job is creating workflows for what I do because, in some ways, I’m creating my job every day. I document processes for everything and I keep these updated constantly. • On Wednesdays I office in the main library with some of the Research & Instruction Librarians. This gives me an opportunity to have some face time with colleagues that I otherwise only communicate with by email and/or phone. • Established an inter-departmental workflow for cataloging, maintaining and promoting electronic resources purchased by a faculty support department. • Spent a frustrating amount of time trying to figure out if IP authentication was working for a new database and, if not, why not. • Chatted with several subject librarians about various ER-related issues including how to get access to the images in a specific journal when the digital access we have only includes text, a possible future research/publication collaboration, and several upcoming trials that were requested by faculty. • Created a LibGuide modules for a database trial that went live and communicated the availability and parameters of that trial to various subject librarians. • Did some last-minute confirmations and planning with a vendor who spent the day at UNT on Thursday. • Emailed my student mentees to check in with them, see how their spring semester is going. • Attended a meeting of the University Undergraduate Curriculum Committee of which I am a member. Was surprised and pleased to see that there were pastries! • Spent a fair amount of time on email communicating with vendors (got set up for a trial of several interdisciplinary databases we are looking at, followed up on some invoicing issues, etc). • Checked in with librarians in my department to determine how close we are to completing recent orders for electronic resources. It is my job to ensure that once an order is begun the process is completed within a reasonable amount of time. Orders involve, at minimum, two other librarians in the division. Noted expected dates of availability and scheduled times to follow up if necessary. • Typed up notes from vendor demonstrations I participated in on Thursday. • Meeting before lunch to talk about how our budget plan is being implemented and plan for future communications, purchases, reporting, etc. • Lunch at a restaurant with librarians from a part of the UNT library world that I don’t typically work closely with: new connections, yay!. • Meeting after lunch to coordinate a comprehensive evaluation of one of our largest electronic resources, one that we rely on heavily in our day-to-day collection management tasks. • Weekly Friday activity of going through my task list in Outlook to make sure I didn’t miss anything, finishing up tasks as possible and marking them complete, changing dates or adding reminders to upcoming tasks as needed. Obviously, there are many, many details that I did not mention about these days – phone calls, conversations, emails, the unceasing attempt to keep the massive amount of electronic resource information and data organized in a useful fashion, etc. But you get the idea. A day in the life of an Electronic Resources Librarian is a bit unpredictable. Even more interesting is the fact that no two ERLs seem to have the same job descriptions but that may be a topic for another post. It was three months before I realized: each week I was working four hours on the reference desk, but my assignment sheet said I was supposed to be scheduled to work three. One hour – that’s not a big deal, right? I wrestled with this discovery for days! Should I speak up? Was I being petty to point out the discrepancy? I finally emailed one of the librarians that crafted my assignment sheet – he spoke to the desk scheduler and the discrepancy was resolved, no big deal. Only three hours a week on the desk from here on out! It was one hour! Out of forty. ONLY forty! Never in my past life as a non-librarian would I have worried about a single hour, but since I’ve begun the tenure-track life, I measure each minute by productivity achieved, or lack-thereof. I identified completely when Erin Miller, the other (also tenure-track) FYAL blogger wrote, “I have never had to be so concerned with the minute-by-minute flow of each workday,” in her first blog post. Time management! This is nobody’s favorite phrase. I felt little-to-no pressure in my past life as library staff to achieve Great Things. I usually had a few projects going, but deadlines were of my choosing. I’ve long been amused by people that stress how busy-busy-busy they are – especially when I read articles like this. Busy-ness is just another social competition. But as a tenure-track librarian, I now find myself falling into that trap! I’m just TOO BUSY these days! Do you realize what I could do with that extra hour each week? Great Things! And as Benjamin Franklin said, “lost time is never found again.” This is especially true on the tenure-track. When I started my new job, I was basically left to my own devices on the afternoon of my first day. 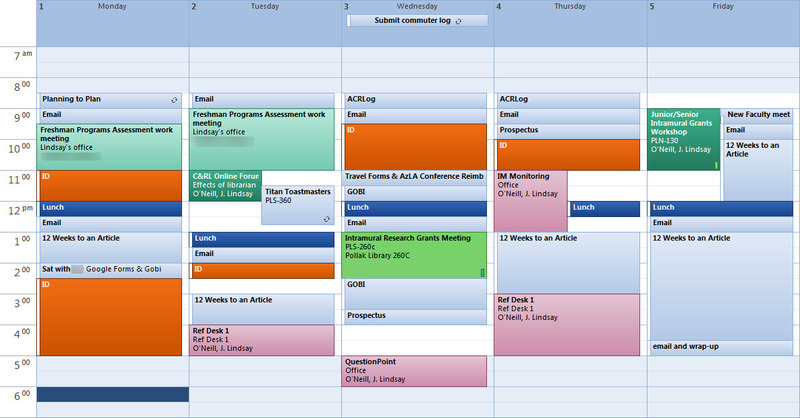 I was suddenly in a brave new world where I had to figure out what I was supposed to be doing and set my own schedule. I hereby admit that lack of structure makes me uncomfortable! So I made two decisions off-the-bat: I would work 8:30 to 5 every day and I started a work diary. I’ve had a lot of jobs in my life. (I once tried to count them all – somewhere around 12 or 15. All but two were hourly). I know that the first days of a new job can go by in a blur. And my job wasn’t just new to me – it’s a brand new position at my library. I didn’t want to feel like I was running on a hamster wheel with nothing to show for it. I decided that a work diary would help me see where my time went and what I accomplished. And it has helped! My “work diary” is really simple – I set up a notebook in Microsoft OneNote and use a page for each month. I fill out a row in a simple table for each day: what time I worked and my accomplishments. It’s only a sentence or two for each day, but I can tell you how much I worked and what I worked on for any day since August 1st. I even started including what I did on the weekends, since I’m one of those people that can hardly remember what I ate for breakfast, let alone what I did on Saturday. There are Four Reasons to Keep a Work Diary as listed by the Harvard Business Review: focus, patience, planning, and personal growth. Writing down what I do each day keeps me accountable and on track (focus) and also shows me that I am making progress on a project even if it doesn’t feel like it (patience). I can see how much time something takes, and that helps me set realistic expectations for deadlines (planning). The article recommends writing 100 words a day about your feelings – I don’t write nearly that much – but if I am feeling especially emotional one day, good or bad, I include that and when I re-read what I wrote I can remember those feelings and think about how I can avoid frustration or find more “wins” in the future (personal growth). I happen to use Microsoft OneNote because it was already on my work computer, but I also like the way it looks and is organized, and that it syncs across platforms. Evernote is also a good choice, or even a simple Microsoft Word document. Keeping a work diary also showed me how heavy my workload was. Seeing how much (or how little) I could accomplish every day quickly helped me discover that I needed to do as much as possible in my work time or I was going to end up either (1) working too much, or, (2) not getting enough done. I love this job but I have no desire to work over my forty hours each week because I also love having a life. Only a month or so in, I was already stressing about all the projects that I wasn’t making any progress on! Enter the 15-minute rule. Juggling multiple projects often means making progress on one or two to the detriment of the others. I committed to working at least 15-minutes a day (on average) on each of my ongoing projects. And guess what? I now get stuff done! When I got here, I told myself to take it easy and not sign up for everything that came my way. But, alas, I’m a compulsive overachiever and I stretched myself thin my first semester. I signed up for an online class through our Faculty Development Center on Universal Design for Learning and made zero progress on it the first two months. Funded by a grant, the facilitator sent out regular emails promising to enter course-finishers in monthly drawings for $100, but even regular promises of financial gain failed to spur me to action. Realizing I wasn’t getting anything done did. When I started scheduling 15-minute chunks to work on the class, I made progress and finished. And then I won that month’s drawing for $100. Personal satisfaction and monetary winnings: best week ever! Okay, so I’m still working on not getting anxious just looking at my weekly schedules, but I’m constantly reminded to stay on track and to get work done. It also forces me to work on things I don’t want to – like doing collection development in GOBI. Scheduling time to work on it in little chunks has helped me make progress instead of waiting until the last minute to order, and now GOBI doesn’t seem so bad. Finally, here’s a counter-intuitive tip: to better manage your time, take a walk. It’s been easy for me as new tenure-track faculty in a brand new position to feel overwhelmed, so whenever it gets too much, I go outside. Often by myself, sometimes with coworkers, and sometimes I grab coffee with coworkers. It helps me to step away from thinking so hard about what I need to do, and it also helps me to clear my mind and find inspiration. At first, in this position, I kept a list of projects I’d like to work on – then I’d look back at it and feel like I was already behind. But let’s be honest – I’m the only instructional designer at my library, and I only have so much time to dedicate just to design. Something like 8-12 hours a week in an average week. Not much! Now, I might sketch out an idea or two for a project on one of the scratch papers in my office, and then I forget about it. The things that really matter and I really want to accomplish never leave my mind. This tactic is especially coming in handy as I start to write my prospectus and need to clarify my research interests. How about you? How do you stay sane and manage your time? Please welcome our new First Year Academic Librarian Experience blogger Erin Miller, Electronic Resources Librarian at the University of North Texas. Having worked as a librarian for more than a decade I feel fairly confident in my ability to navigate the various paths through my chosen profession. Before attending the School of Library & Information Science at the University of Kentucky I worked part time in Circulation at the Public Library of Cincinnati and Hamilton County. During grad school I was a student assistant in the Appalachian Archives, creating finding aids and organizing collections. My first job with an MLS was as a Content Manager for SirsiDynix, working with a team to design and develop a totally new research tool and content management system. Next stop was the library of a private high school in Cincinnati where I managed every aspect of the library, from circulation to database instruction, from supervising volunteers to collection and budget management. 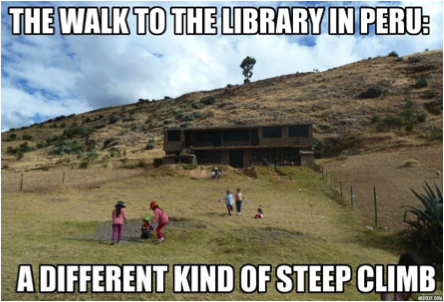 I also organized a small library in Peru – in Spanish­ – as a service-oriented project during several weeks I spent in the Andes. Luckily, I like learning new things and adapting to new situations because in each of these library settings there has been a learning curve…but none quite so steep as there has been here at the University of North Texas. Some of the learning curve is to be expected at any new job and mostly involves both unfamiliar technological and unfamiliar geographic landscapes. For example, here at UNT our ILS is Sierra from Integrated Interfaces, Inc. while both the public library and the high school library ran on SirsiDynix. Similarly, we use a different content management system for web content. Being extremely directionally challenged, for me any new job (much less new city) results in what can be a very frustrating process of wrong turns and time consuming, usually useless, conversations with Siri about where on campus is that d@#! building in which my meeting starts in five minutes, etc. These are all part of the expected learning curve and, as such, do not cause me much stress. I ask lots of questions and have made it to almost every meeting on time (except the ones that happened during my first month – pretty sure I was late to every single on-campus meeting for the first few weeks). However, some things here at UNT are so new to me that I find myself looking not only for directions but also re-evaluating the ways that I have worked successfully for the past ten years. For one thing, librarians at UNT are faculty-equivalent which means we are expected not only to be responsible for keeping the library running smoothly, but are also expected to publish in peer-reviewed journals, to present at conferences and to serve in various ways at various levels, from within the library to university wide to national organizations. While none of these things are inherently difficult on their own, I do find it challenging to have so many more balls in the air at any one time. I can easily fill up a 40-hour-and-then-some week with just day-to-day tasks…how in the world do I find time to write a proposal for a conference or to meet with the students I’m mentoring, etc.? This pressure has already forced me to evaluate my time management skills and to reassess how well I use tools like Outlook to improve my own efficiency. Additionally, because of the intensive tenure-track evaluation process I’m also spending valuable work time keeping track of what I do on an ongoing basis. Other than the brief time I spent as a consultant with billable hours while I was at SirsiDynix I have never had to be so concerned with the minute-by-minute flow of each workday. Let’s just say that keeping track involves multiple spreadsheets, a Word document and a very detailed Outlook task list. Then there is the new-to-me challenge of having to figure out where I fit in to the department workflow. With all of my previously-held library positions there were specific and easily visible responsibilities. At my last job it was very clear – if I didn’t do it, nobody did! Here we have a fairly good-sized collection management department and people tend to work collaboratively – which is great, even though sometimes I’m not sure if I am responsible for something or if somebody else is already working on it. For example, the process for ordering a new electronic resource involves different people being involved at different stages of the process, from decision-making to order records to contracts to invoicing to cataloging. When it comes to a straightforward new order I think I’ve gotten my role figured out…but if the order is for something a bit different – say, for converting a standing print order to a series of ongoing firm ebook orders – well, it can be confusing. Thankfully, I have colleagues that are willing to work together to figure out how to move forward in such situations! I just don’t have time to list everything I’ve learned so far at UNT. I haven’t even gotten to the part about what it’s like being an Electronic Resources Librarian, a position relatively new to the library and lacking a universal job description (the ERLs I know all have widely disparate responsibilities). I will save that discussion for the presentation called ‘Fake it Til you Make It’ that I’m hoping to do at the ER&L Conference in Austin. Just to be clear, I am not complaining! I am very grateful for these new opportunities, enjoying the challenges, loving the personal growth I’m experiencing…and I even like Texas, especially the great big Texas skies. Next week, I will travel to the other side of the county for my 10 year undergraduate college reunion. I’m excited and nervous about going back to my old college haunts. Part of the nervousness comes with the territory at any reunion: will I have met an acceptable number of life-milestones in order to not be shunned by my classmates? However, some angst is more specific to my situation. My undergraduate institution is an elite women’s college that employs a lot of rhetoric about preparing professional women to do important work in the world. Am I doing important work? I would argue that yes, my work at the library plays a very important role in the life and health of the academic institution. Ah, but am I a professional? About that bit I am less sure. 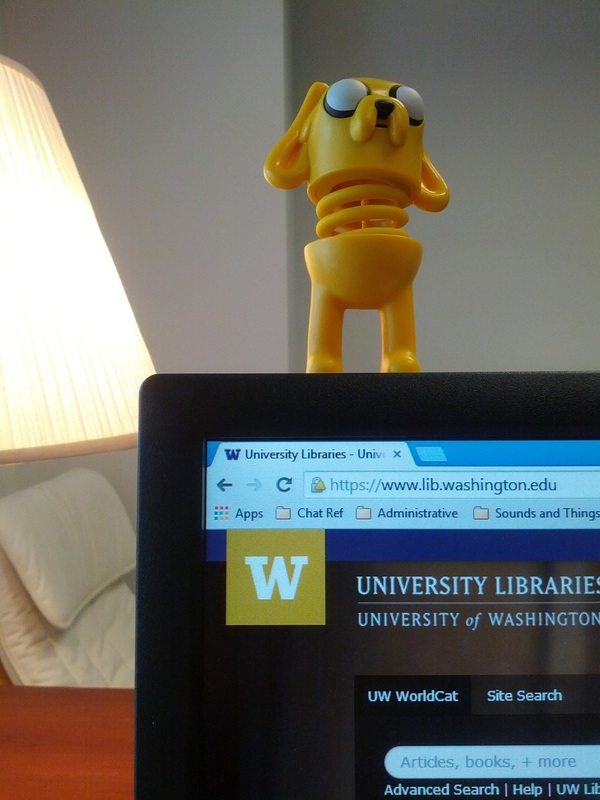 Jake the Dog looks on as I get some serious work done. But as a new librarian, it can be difficult to ‘be professional’ because professionalism itself seems to be a moving target. Everyone I work with seems to hold themselves to different standards when it comes to how to dress for work, how much to share about one’s personal life, and how to conduct oneself on social media. As usual, the internet can help. I’m a big fan of the Adulting Blog, which provides a host of humorous and useful aphorisms for those of us who are trying hard to behave like adults. Numerous library blogs address these issues, and I particularly like the level of granularity that the I Need A Library Job Blog sometimes reaches…one recent post focused on the use of pronouns in thank you notes; specific but usefully so. And if, like me, you are part of or on the cusp of the millennial generation and have limited stores of self control when it comes to the internet, this list of tools at 99u can help you block offending sites and rediscover your focus. Ultimately, I’m happy that I didn’t join a profession where I would be expected to wear a suit and heels, or never to talk about with coworkers about ‘that cute thing that my dog did yesterday.’ Likewise, it is probably to the good that library schools tend not to overemphasize workplace conduct…most of it is common-sense knowledge that is more effectively learned through communication backchannels from peers and advisors. But I believe that putting some thought into what kind of professional I want to be; actually articulating to myself my own professional standards and how I can do a better job of holding myself to them, is a good exercise for a new librarian. 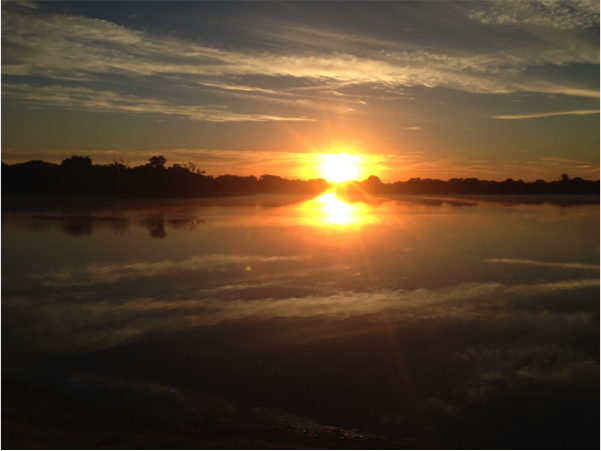 Author Chloe HorningPosted on May 5, 2014 Categories First Year Academic Librarian Experience, UncategorizedTags new librarian, professional development, reflection, time management1 Comment on Professionalism–are we there yet?